Membranes in a water treatment facility. Investing in innovative technologies to make desalination more affordable and energy-efficient will help many communities across the United States. Bureau of Reclamation Commissioner Brenda Burman announced that 16 entities will receive $3.5 million for laboratory and pilot-scale research projects as part of the Desalination and Water Purification Research Program. The DWPR Program works with Reclamation researchers and partners to develop more innovative, cost-effective and technologically efficient ways to desalinate water. Nine laboratory projects and seven pilot-scale projects were selected for funding. A laboratory-scale study is typically a bench scale study involving small flow rates. They are used to determine the viability of a novel process, new materials, or process modifications. Research at this stage often involves a high degree of risk and uncertainty. A pilot-scale project tests a novel process at a sufficiently large scale to determine the technical, practical, and economic viability of the process and are generally preceded by laboratory studies that demonstrate if that the technology works. The $3.5 million will be matched with $4.8 million in non-federal funding. 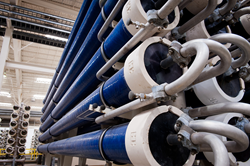 To learn more about Reclamation's Desalination and Water Purification Research Program and see complete descriptions of the research projects please visit http://www.usbr.gov/research/dwpr.